Manufacturing, Trading, Importer and Exporter of Engineered Springs. 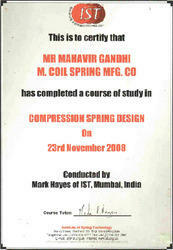 Established in the year 1979, we, "M. Coil Spring Manufacturing Company", are engaged in manufacturing, exporting and supplying of precision range of Engineered Springs. we are able to create a niche for ourselves in the industry for Compression Spring, Torsion Springs and Spiral Springs. His profound experience in wire forms and strips has guided us well to emerge out easily through the tough competition of the industry. His ethical and innovative approach is the true force behind our amazing growth in the industrial arena. Under the able guidance of our mentor, Mr. Mahavir S. Gandhi, we are able to create a niche for ourselves in the industry. Backed by our committed workforce, we have been developing springs that are widely used in catering the requirements of various industries. With our consistent quality springs, we have been serving large customer base in Middle East, USA, Malaysia and across India. We work with an aim to improve and enhance productivity to meet the growing requirements of our clients. We are well equipped with a state-of-the-art manufacturing unit, which assist us in meeting the requirements of our clients, spread across the globe. Our production unit is spread across a vast area and is equipped with technically advanced machines, which regulate the manufacturing process. Based on our full-fledged infrastructure we are able to meet the bulk and growing demands of the industry. We make use of Automatic coiling machine in the production of springs to meet the requirement of several industrial applications. We have separate departments for each process such as procurement of raw materials, production, quality check, marketing of products and customer care, these departments work in close co-ordination with each other to manufacture products in a stipulated time. We are determined to provide premium quality Engineered Springs as a result we adhere to streamlined and established quality strategy. Our activities are in line with the international norms and standards. To ensure quality, we have incorporated a quality control department, which is managed by a diligent team of quality experts. Our quality analysts endeavor to implement quality in all our processes and products, to ascertain flawless springs leave our premise. From the very beginning we ensure raw material sourced is in conformance with the American standards. Further, our quality efforts have been duly awarded by some of the leading companies like Godrej and Ganak Health Care. We consider our workforce as our key strengths, which assist us in meeting client’s requirements completely. Quality inspectors conduct various tests/checks during the production stages and on the finalized products. Our Research and development professionals endeavor to innovate ways to enhance our existing springs and to develop new products. Our customer support executives are capable of handling all the queries of our esteemed clients. Additionally, to enhance the skills of our team members, we conduct training sessions at periodic intervals. Our precision-engineered springs are renowned for longer service life and stable capacity control. These features ensure they are used in various industries across the world. With our consistent efforts, we have acquired a large base of clientele spread across Middle East, USA, Malaysia and India. Our highly functional springs are catering to the diverse industrial requirements. Further, to facilitate hassle free transaction, we provide our client’s with various easy payment modes including cash, letter of credit and demand draft. We are counted among prominent manufacturers and exporters of springs.